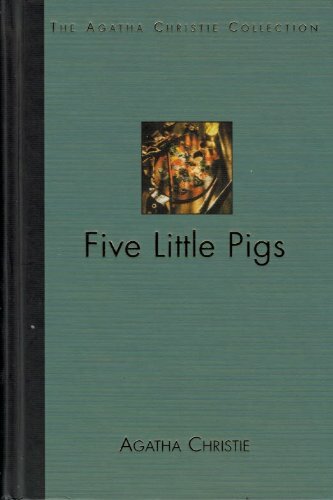 Five Little Pigs (1942) is one of my all-time favourite Christie novels, involving a retrospective case of murder. I love how character personalities are paramount and the way Poirot builds up the solution piece by piece. The story begins with Carla Lemarchant visiting Poirot, wanting him to investigate Amyas Crale’s, her father’s murder. The only thing is, is that it happened 16 years ago and that her mother, who died in prison, was convicted for the crime, having believed to have committed the murder in revenge for Amyas’ supposed plans to leave her for the woman he was currently painting, Elsa Greer. Carla who wants to marry is keen to know the truth and a letter she was given on her 21st birthday, written by her mother all those years ago, seems to suggest that the truth hasn’t yet been found. Poirot returns to the principal characters involved in the case, honing in on the five main people who were in and around the Crale household at the time. One of the things which I love about this book is how much depth Christie gives her characters. Stock characters such as the unfaithful spouse, the cheated on wife, the other woman are all in this book, yet they all rise above their expected stereotypes and in their complexity Christie reveals how hard it can be to correctly read another person. This is especially borne out in how characters retrospectively perceive Caroline, with each person looking at her in a slightly or greatly different light, depending on their own personal biases. I enjoyed evaluating the evidence characters gave about Caroline, as the testimonies given are a mixture of truth, lies and assumptions, the latter often very distorting of what happened. A character which had a surprising amount of depth was Elsa Greer. Early on in the story she is summed up as ‘very good-looking, hardboiled, modern’ and ‘to the women in the court she stood for a type – type of the home-breaker…’ Yet to Christie’s credit she becomes much more than this. I’m not saying she becomes likeable but she evolves into a more developed character. Poirot quickly deduces that there is an element of the ‘hero worshipper’ in her, which has hugely influenced the men she has married. Furthermore, I think the text subtly suggests that this ‘seeking for… [a] life-sized hero’ has not left her happy. It has left her disappointed and empty, having done nothing with her life and her marital choices not compensating for this. In a way she is a contrast to Caroline’s younger sister, Angela Warren, who makes something of her life by becoming an explorer. Throughout the story light and dark, strength and weakness is attached to Elsa, which is best encapsulated in the phrase ‘a predatory Juliet.’ Moreover it is often stressed how young she was when this all happened and more than once Christie mentions the vulnerability and ruthlessness of youth. The ending of the novel which has always had a huge impact for me continues this ambiguity, there is no sympathy but there is pity that Elsa has in some ways not grown or developed from the time Amyas died. One of the things I noticed during this reread is how interchangeable Elsa and Caroline are. You could almost postulate that Elsa is Caroline’s alter ego to an extent, such is the duality. Like many an alter ego pairing, (see The Strange Case of Doctor Jekyll and Mr Hyde (1886) and The Picture of Dorian Gray (1890)), Caroline is arguably killed due to Elsa, the real murderer, as her killing of Amyas leads to Caroline’s own demise. Another literary alter ego pairing can be found in Jane Eyre (1847), where some have argued that Bertha Mason represents Jane’s uncontrollable and volatile side, which Jane ultimately rejects. It is possible to pose a similar reading here in as much that whilst Caroline has learnt to control her anger and ensure it doesn’t erupt into physical violence again, Elsa has not and within minutes of hearing that Amyas was not going to marry her she plots his death. What principally led me to thinking there was a duality between Elsa and Caroline was the number of statements said about Caroline which could also be applicable to Elsa. At the beginning of the book both women are said to be ‘hardboiled’ and a criticism levelled at both of them is lack of self-control. Furthermore, Philip Blake, a childhood friend of Amyas, sums Caroline up as ‘cruel and malignant and a grabber’ and it is the last adjective which caught my attention most. It is used in reference to how Caroline married Amyas, with Blake arguing that Caroline married him due to predicting he would become successful, famous and well off. Whether this is true or not, looking at Elsa’s string of marriages the term ‘grabber’ definitely fits, with Elsa having sought after wealthy, important, titled and talented men. Moreover, their duality also resides in their passion for Amyas as Caroline is said to be ‘the possessive type of woman. Unable to accept facts,’ in that she couldn’t accept Amyas leaving her. Yet in reality when Elsa is revealed as the true killer this statement could equally apply to her. I wouldn’t say Caroline suffers from hero worship in the way Elsa does with Amyas, but I do think she is completely devoted to him to the extent that when she has been convicted she writes to her sister ‘I couldn’t have lived without him,’ regardless of his philandering. The duality is also reinforced by Elsa herself as whilst trying to conceal her own guilt, she imposes her own motivations and emotions behind the killing onto Caroline. The line which best captures this is when Elsa says ‘I think she was quite prepared to kill him rather than to let him go – completely and finally to another woman.’ A statement which I think speaks volumes about Elsa and Caroline equally. It is suffice to say that both Elsa and Caroline loved Amyas and I think it is through this complete devotion that Christie blurs the lines between death and life. Amyas in a way gave both these women their centre, their purpose and it is shown quite clearly that his death led to their deaths in one way or another. For instance with Caroline even before she died literally in prison, people who remember her from the trial said that ‘And yet, half the time, she wasn’t there. She’d gone away somewhere, quite far away – just left her body there, quiescent, attentive, with a little polite smile on her lips.’ Conversely, whilst Elsa did not die literally the novel emphasises how a part of her did, ‘the living, ardent, joyous Elsa died also,’ leaving ‘only a vindictive, cold, hard women.’ Elsa’s own words support this notion of a living death when she tells Poirot that Amyas’ death ‘killed me. Ever since there’s been nothing – nothing at all. Emptiness! Like a stuffed fish in a glass case.’ The allusion to Shakespeare’s Juliet also makes this an interesting notion as we know Juliet’s devotion led to her death, yet here the story is postulating what ‘Juliet a survivor’ would have been like, only to suggest such a person would not be the same; ‘Was it not an essential part of Juliet’s makeup that she should die young’. I think both Caroline and Elsa could be accused of loving too much, to the extent that it impacts their other relationships and I do wonder whether Christie is suggesting through these characters the dangers of total love and of attaching yourself so completely to one other person that you cannot stand alone. The ‘problem of personality’ is one of the key aspects which make this a great read for me and I love seeing how the characters misread each other, which leads to erroneous assumptions and even a miscarriage of justice. Often this misreading comes about because the characters impose themselves into the others’ situation and then make assumptions from that. What I also love about this book is how it shows that a murder creates more than one victim, having a profound and often negative effect on the survivors. I think one of the things which holds my attention with this book is the duality of the evidence, as often the characters think it means one thing, whilst it means the opposite and I also like how Poirot’s own cryptic remarks hold a dual meaning. For example, he says ‘Until you know exactly what sort of person the victim was you cannot begin to see the circumstances of a crime clearly.’ The obvious victim to understand is Amyas of course but I think the story suggests there are other victims in the tragedy who need to be understood for it to be solved, not least Caroline. A stray comment which arrested my attention was when one of the characters says ‘with women, love always comes first… men, and especially artists – are different.’ Whilst Christie’s work upholds the single track focus artists have when pursuing their creations, with Henrietta Savernake from The Hollow (1946) providing an interesting parallel with Amyas, I don’t think her oeuvre entirely maintains this depiction of male priorities, as evinced by The Murder at the Vicarage (1930), Death on the Nile (1937) and Murder in Mesopotamia (1936) – the latter particularly showing the consequences of a possessive love. As with Cards on the Table (1936), Christie effectively uses a small cast of characters in a story which really focuses on suspect/witness testimony. The solution I thought was cleverly constructed, not using the clichéd foot prints or cigarette ash, but with verbal clues and an astute insight into human character. It is also a very poignant and powerful solution, which avoids conventional resolution and the killer in this book is probably one of Christie’s coldest. For those who believe Christie didn’t write fully realised characters you need to read this book. Martin Edwards at Do You Write Under Your Own Name? I, too, count this as one of my favorites, Kate. (JJ doesn’t like it, – he thinks it’s repetitive – so watch out!) I enjoyed reading your take on it. That said, I think I disagree with about half of what you said. Case in point: I don’t think the murderer is one of Christie’s coldest. There aren’t a lot of examples in AC’s canon that better show the effects that killing someone can have on the killer than this novel. I think this killer is one of Christie’s most tragic. However, I will say no more. I will simply bide my time and write my own post on it one of these days. Mwwahh – hahhh – haaah! Well I think you have to be pretty cold to sit there and watch your victim slowly die. I can see how the killer didn’t prosper after their deed but I don’t find that part of the book the most tragic. I find the fact that Caroline kept quiet and implicated herself and allowed herself to get convicted all because of the erroneous belief that her sister was the killer is the most tragic part. If Caroline hadn’t felt so guilty and hadn’t misread her sister then the miscarriage of justice may not have happened. Anyways glad you love the book too and I look forward to reading your own astute thoughts on it. It’s not just that I think it’s repetitive — it is repetitive! The entire second section is just the first section again but with one tiny thing added — one! The situation itself is superbly set up, the seeming inescapability of the conclusions already reached before the start of the book apparently never in question and reinforced at every turn, and Christie does an awesome job at not only deconstructing that but also in giving the reasons for it havng hapened in the first place — it might evern be the best piece of plot construction she’s ever done (yup, even more so that with Ten Little And Then There Were Indians) — and I completely agree that her use of character is absolutely superb, and it ends on a marvellously…frustrating note. In virtually every regard it’s a masterful piece of detective fiction, but oh dear sweet Jiminy Cricket that second section is so close to pointless as to almost qualify as a Galdys Mitchell “investigation”. And that is so very frustrating! I didn’t find it annoyingly repetitive but I think it was because I was more interested in what the second section revealed of people’s characters rather than specific facts about the crime and the day leading up to it. Unlike a GM investigation, this one actually makes sense and I think Christie has a much less dense and quicker writing style than Mitchell. You’ve definitely got a good point on the plot construction, I like how all the little bits of misread overheard conversation reveal a darker solution. What Christie book are you up to now? Yeah, I have only read this once, and that was a few years ago, so a second look may reveal hidden depths to that second section. Who knows?! Endless Night was my most recent Christie; I have a gap of four books now, so I have to actually go out and — gasp! — buy some for the first time in years. Shock horror! You mean you don’t have the complete set of Christie already? Well at least her books are fairly easy to get a hold of. Mitchell’s plots are pointless and don’t make sense? Which did you have in mind? I agree, though, that Mitchell’s prose style is different from Christie’s; Christie’s prose style is sparer and simpler, which is why children and non-native English speakers can read her with ease. Christie also uses a lot of dialogue, which may be why she took to play-writing. She seldom describes settings, and lacks the sensory detail of Carr, or Chesterton’s attention to colour and light. Mitchell’s, though, is witty and bracing, and she was admired by Philip Larkin and Edmund Crispin (“the most perfect and pellucid prose-writer in crime fiction”). Glad you enjoyed the post. haha yes that quote by Crispin always makes me laugh. In terms of confusing plots I remember The Twenty Third Man left fairly confused, have a feeling Watson’s Choice had a rambling plot as well but I can’t remember enough about it to be sure. As to boring plots there is Come Away Death, Death and the Maiden, The Rising of the Moon and The Longer Bodies for instance. I don’t mind density of prose, as I am a Sayers fan, but I just often find Mitchell’s style of dense prose quite boring and a pace killer. My favourite Mitchell stories are Speedy Death, The Saltmarsh Murders and The Mystery of the Butcher’s Shop, though it has been a while since I have read them. Don’t get JJ started on those ones, as he is definitely not a fan of them! I think Tom Brown’s Body was also good and Death at the Opera, but again memory is a bit hazy on them. At the risk of making an oversimplification I’ll say that the novel is really a study in perception and memory. If any reader is fascinated with this aspect of being alive and human — neuroscience and the study of both perception and memory are hot topics in our 21st century, making it all the more relevant– then this book is absolutely a must read. It’s one of her top five IMO. Hit the nail on the head there. Glad it’s a book you love. Interesting that you bring up the theme of loving too much and attaching yourself wholly to one person. And you do get that sense of obsessive love through both Caroline and Elsa. But you also sense that in Elinor Carlisle in Sad Cypress and even in Nemesis with Clotilde-Bradbury Scott where obsessive love falls to the extreme and is at its peak. It’s in stories like these which brings a far greater depth in Christie’s writing which makes her writing shine even more. And in regards to character, they display greater dimensions of human nature, specifically the affairs of the heart.